Having spent the majority of my career working in the nonprofit field, it’s hard for me to fathom the unbelievable excesses that those in the business world took advantage of in the mid-2000s, until the economy tanked. It sounds similar to the “greed is good” philosophy that pervaded the 1980s, and much as during that era, those who rose the highest often fell the hardest. 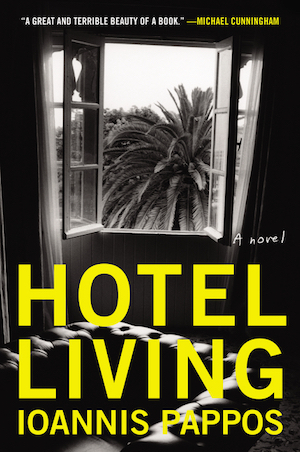 In Ioannis Pappos’ Hotel Living, Stathis Rakis flees his seemingly ordinary life in a small Greek village to pursue college and a career in San Francisco, and then decides to attend a prestigious business school in Paris to obtain his MBA. It is there that he befriends a number of privileged expatriates from all over the world, whose lives of profligate spending and entitlement amaze him (while causing him some amount of envy), and he is a bit of a paradox to his friends. During graduate school, Stathis also falls—hard—for Eric, a liberal journalist with a strong social conscience despite his own privileged upbringing. After graduation, Stathis takes a high-paying job as a management consultant, and finds himself spending the bulk of his time living in hotels, building relationships with the hotel staff, and moving from city to city as his job warrants it. When he isn’t working, he’s pining for Eric and trying to figure out where he fits in Eric’s life, all the while both loving him madly and being angered by Eric’s philosophy of the world. As their relationship waxes and wanes, Stathis fills his minimal amount of spare time uneasy in the social spotlight, trying to salve his emotional turmoil with copious amounts of drugs and alcohol. And his downward spiral is fueled by his heart, his greed, his ambition, and his conscience. I found this book thanks to an ad on Goodreads (the cover blurb by Michael Cunningham caught my eye), and I found it tremendously well-written, part social commentary on this culture of excess and wanton lust and addiction, and part an emotional chronicle of a man who can’t seem to overcome heartbreak, someone unable to return to the world he knows but not-quite-comfortable with the world he lives in. Stathis is a fascinating, immensely flawed character, and his crises are painful to read about but compelling at the same time. I could have done with a little more character building and interpersonal relationships in the book and less with the extensive details about the work that Stathis and his friends did, and at times the book introduced so many characters at once it was hard to discern who was whom, but Pappos created a fascinating look at a world that many got to experience, while not many came out unscathed. Stathis is a complex character I can’t get out of my head, and I’d love to know if Pappos has given any thought to what came next for him.